There are many factors to consider when looking for a commercial rubber flooring product. Making the right choice for the application is key to having a surface that will perform to your expectations, or that will create the design features you are looking for. Rubber is inherently anti-fatigue. 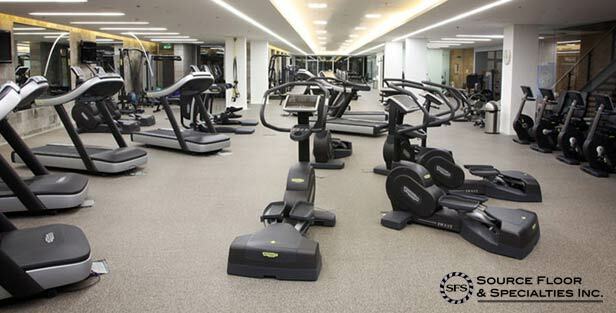 All rubber flooring has anti-fatigue properties due to its ability to compress under load. Even a small amount of compression helps absorb impact from footsteps, and cushion joint loads when standing. Rubber is inherently anti-bacterial. There is nothing within any type of rubber flooring that encourages or generates bacterial growth – only what you introduce to your rubber flooring (and your cleaning regimen!) can contribute to the growth of bacteria. There are certain environments that require specific types of resilient flooring due to the high risk of bacterial presence (such as hospitals); in these cases, a non-porous rubber product should be used. Not all rubber products are made equal. They may share the same basic ingredients, but it’s all in the proportions of each ingredient, the quality of the ingredients they start with and each manufacturer’s process. There is Good, Better, and Best to factor into your budget and decision making. Not all rubber smells! In reality, there are very few rubber flooring products on the market today that have strong odors. Vulcanized rubber products (especially in recycled rubber) will have a noticeable smell to them due to the recycling and manufacturing process. For vulcanized products, crumb rubber is mixed with a binder (usually polyurethane) and then heated to an extreme temperature that virtually melts the rubber. This melting process causes the encapsulated ingredients of the tire crumb to be released. A cured rubber product is subjected to a much lower temperature of heat (or no heat at all with some manufacturers), thus leaving the rubber crumb in its granular state. The second contributor of odor is the synthetic rubber (EPDM, in recycled products) – a high quality EPDM will have very low emissions, whereas a lower quality synthetic granule can have a ‘fishy’ smell. If you aren’t familiar with the specific rubber product you are considering, ask for a physical sample so you can check for odor as well as density. Rubber has a memory. If a rubber floor is manufactured from a roll, it will inherently retain its curl and will tend to becoming a roll again. Rolled rubber should be glued down for best results. If a rubber floor is manufactured flat (from a block), it will always lie flat – even when loose-laid. 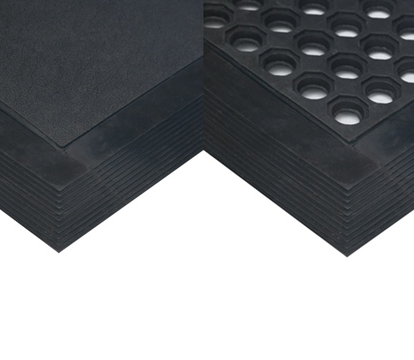 Flat/block is your best manufacturing option when considering interlocking mats. What rubber flooring should you choose for your project? Choosing the best rubber floor depends a great deal on where you’ll be installing it. Different types of facilities have different needs, and it’s important to consider all aspects when choosing a floor. There are wonderful synthetic rubber options for these environments. Color palettes and textures are expanding with these products constantly, giving you more overall appearance choices. To add some funk to your floor we can cut and inlay intricate designs or logos directly into the flooring for that “Wow!” factor. Recycled rubber manufacturers are creating some amazing color mixtures for commercial applications. 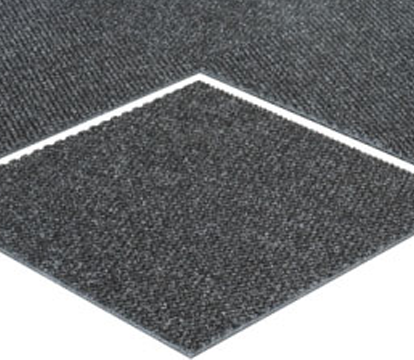 If you want the benefit of rubber – but the appearance of carpet tile – this is a great place to start. Check the density. A product that has lower rubber content/higher polyurethane will feel spongy and you will be able to see the pores and granules clearly. A higher density product has a higher rubber content, will be less porous, and will outlast the others by 2 to 3 times. If you’re unsure, check the weight per square foot for equal thickness – higher weight means a higher rubber to binder ratio, which gives you a higher density product. A loose-lay, interlocking floor is an ideal solution. When managed properly, interlocking tiles allow you to rotate mats from high traffic zones to light/no traffic areas to extend the life of the floor (like rotating the tires on your car!). If manufactured from a block (as opposed to cut from a roll), you will also be able to flip the mat should the top ever become damaged. Interlocking tiles also allows you to take the floor with you should you vacate the premises (ideal for leased locations). Be careful around dumbbells! Special attention should be given in areas where heavy weight training will take place. Additional matting will be needed to protect the subsurface. Always ask for what options are available – Fitness Tiles, Thud Mats, and Platforms are some examples. In these applications you should always use a glue-down product. The glue will act as a barrier to any snow, ice, or water being trapped beneath the flooring. The glue will also restrict the mats from expanding and contracting due to temperature fluctuations. A 10mm thickness in a good quality recycled rubber mat will hold up very well against ski boots and skate blades. But always check to make sure a manufacturer will warrant their product for these applications! Source Floor can create any logos, messages or designs into all of the rubber products we carry. Thinking about rubber? We would be happy to help you make the right decision for your application and budget.